A Flash-SMS Solution for Mobile Operator to do frequent marketing to Mobile Operator's Subscribers using flash SMS. 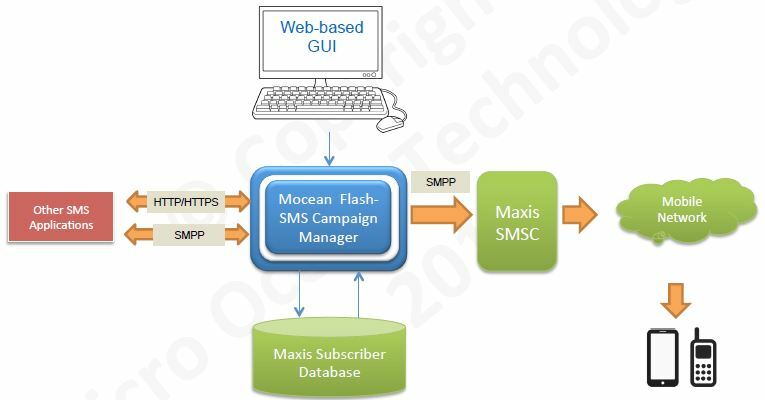 Mocean Flash-SMS Campaign Manager allows Mobile Operator to manage Flash-SMS Campaigns via our web-based user interface, or integration via SMPP/HTTP APIs. Integration or connect to Mobile Operator's SMSC to deliver the SMS. Interface or integration is provided to Mobile Operator's Subscriber Database to obtain MSIDN. The system is also able to support message delivery from 2 million messages per day & above.